A team of researchers at Southern University of Science and Technology in China has found a way to use shear forces to create a self-assembled supramolecular hydrogel from a sol. 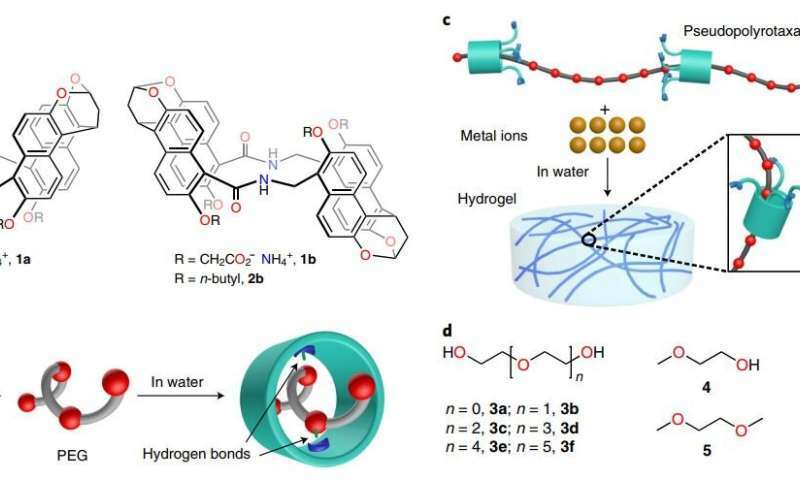 In their paper published in the journal Nature Chemistry, the researchers describe how they created their hydrogel and some of its properties. The researchers noted that supramolecular hydrogels are generally destroyed by shear forces resulting in conversion to a sol (a colloid with solid particles). They were working with bioinspired versions of molecular self-assembly typically seen in nature, such as occurs with self-healing in animals. They noted that in the natural world, such assembly is usually seen in materials with a complex architecture and have very focused functions. Those made in the lab, in contrast to those in nature, have typically been more stable. As part of their experiments, the researchers added copper ions to a solution of pseudopolyrotaxanes (which were created by threading molecular tubes onto polyethylene glycol chains). They found that when they vigorously shook the cylinder holding their solution, the material inside transformed into a gel. The researchers explain that the shaking exerted shear forces on the ingredients forcing intrachains to become interchains with little to no crosslinking with other pseudopolyrotaxanes. The researchers report that the gel had promising properties and compared favorably to other gels, and it is stretchable to 30 times its non-stretched length. They also found that it reverted back to a sol when left on a table overnight at room temperature. But shaking it returned it to a gel. They report that the cycle could be repeated up to five times before it began to degrade. They note also that the cycle represents a form of self-healing. The researchers suggest the form of dissipative self-assembly demonstrated by their experiments would very likely be of use to material scientists because of the gel's ability to mimic natural self-healing—they suggest it could also prove to be quite adaptive. They also note that the resultant gel was stronger than other structures created using synthetic dissipative self-assembly, and demonstrates better mechanical properties.